This week Charlie looks at decision making during incidents and offers some tools and techniques that he has picked up through his research. For a while now, I have been thinking about and looking at ways of making decisions during incidents and have been looking at simple tools and techniques that I can teach to incident management teams. There is an art to good decision making and some people are either just good at it, or when a major decision needs to be made are just lucky they made the right call. However, the right decision has often been made for the wrong reasons! For those who know they are not brilliant at decision making or don’t want to rely on luck I have been looking at simple tools and techniques which are easy to teach, and for teams to understand and therefore use during an incident. One of the tools many try to use and adopt is the police decision making model, which if you google you can find a number of documents on what it is and how to use it. Many consultancies teach a civilian version of it. For me it is a little too complex and I am still on the lookout for something more simple. In my quest for insights and tools for decision making I came across an excellent paper by Carolyne Smart and Ilan Vertinsky called “Designs for Crisis Decision Units”. This was the same paper I used a couple of weeks ago to talk about the effects of stress on those managing incidents. Part of this paper discussed groupthink and some techniques for avoiding it. Recognising the effects of stress and making sure that you avoid groupthink all contribute to making sure that during incidents you give yourself the best chance of making effective decisions. According to the Cambridge English Business Dictionary, groupthink is defined as “the process in which bad decisions are made by a group because its members do not want to express opinions, suggest new ideas, etc. that others may disagree with”. 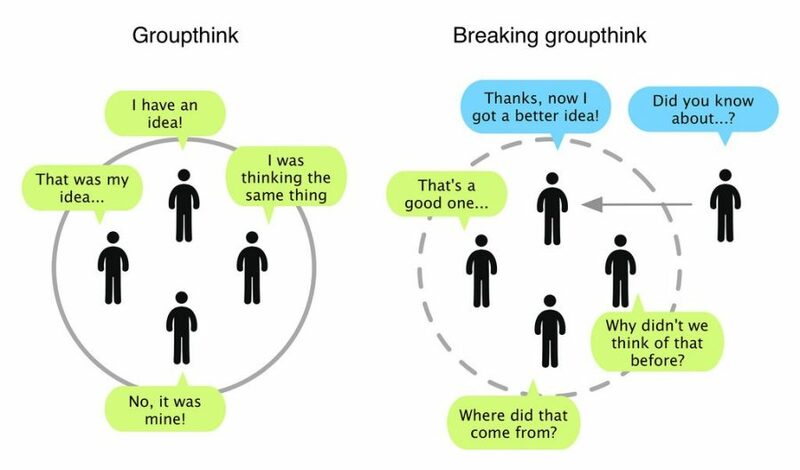 I personally think that groupthink is more likely to happen during a major incident because many of the members of a team may not have been in these situations before. They are more likely to take the lead and agreement from others, thinking that they may have more experience and therefore are more likely to make the right decisions. A classic historical example of groupthink is when the American establishment received a number of intelligence reports that the Japanese were going to attack Pearl Harbour but chose to disbelieve them. The Bay of Pigs invasion of Cuba is sited as another example. Under the administration of Eisenhower, the CIA planned to infiltrate Cuba and launch a military attack within the country. When Kennedy took over, he gave green signal to this attack, despite concerns raised by figures such as Arthur Schlesinger and William Fulbright, the invasion resulted in a fiasco where the U.S. forces were defeated by the Cuban army within 3 days. Group ignore warnings and negative feedback that might force a reassessment of a decision. Attempts are made to rationalise the status quo. Group develops mindguards who are self-appointed members who shield the decision makers from members who go against the shared beliefs. Update from last weeks bulletin. Having watched a video of the AGM I can confirm that this was not said during the AGM and that this is not true. Thanks to James McAlister for pointing this out to me!